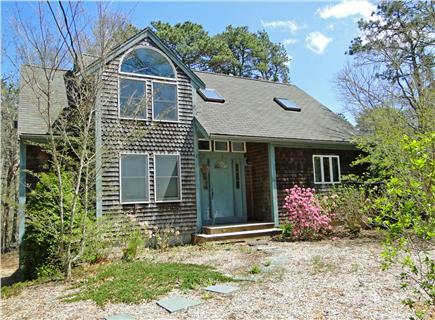 Beach: Drive to South Cape or Falmouth beaches, 4 mi. Enjoy staying in our bright, spacious family home in one of the loveliest parts of Falmouth. The house was built in the mid-1990s and has a contemporary feel, with a skylighted stairwell and hardwood flooring through the first floor living space. 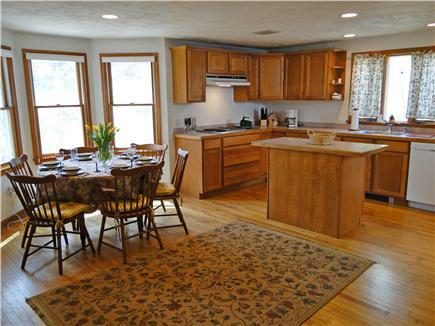 A great room flows from the efficient, islanded kitchen with a window to the yard,to a bay-windowed dining area. A bright living room area with a wood-burning fireplace and sliding doors leads to a mahogany-floored, wood-framed screen porch complete with paneled ceiling and two skylights. 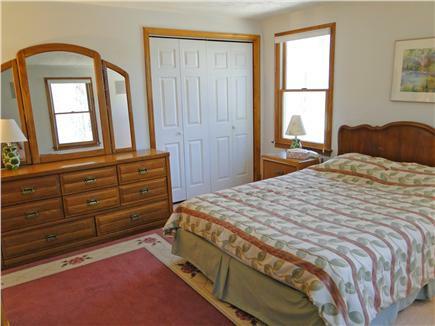 The ground floor corner master bedroom has a queen bed, three windows, two closets, and a full bathroom with a shower. There's also an office and a half bath. House has been recently refurbished and has just been listed seasonally for 2019. 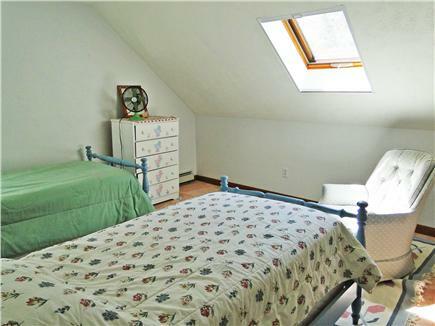 Upstairs are three bedrooms and a family bath. One bedroom has a double bed, and one has two twins and its own skylight. 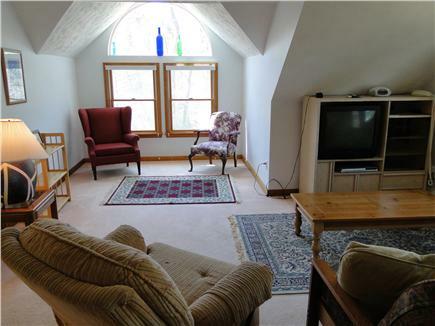 The third is a front to back large space with an arched window wall, set up as a family/TV room, but it also has a double futon for additional sleeping space. 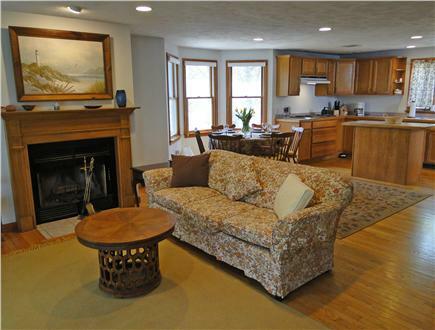 The garage level includes a carpeted space; full size washer and dryer; and two car garage. A gravel drive can accommodate additional cars. The house sits at the top of a wooded acre and has a sports court with a half-court basketball hoop. Window A/C units in the master bedroom and family room will keep you cool, and high speed wireless internet will keep you connected. Waquoit is a beautiful area and you can walk down the road each morning to views of the Moonakis River flowing out to the bay and watch the baby osprey in their nest, or even a bit further to the bay itself, open to Martha's Vineyard Sound. It is a short drive to South Cape Beach, a long, sandy state beach on MV Sound, reached without going onto busy Route 28. You can beat the crowds to one of the best breakfast or lunch spots in Falmouth, the Moonakis Cafe, under 1/2 mile away. Or you can shop until you drop, catch a movie, or stock up on groceries at Mashpee Commons, less than three miles away. 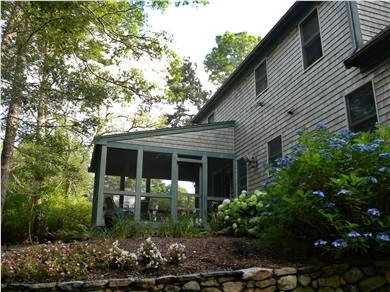 Waquoit offers good access to other sections of Falmouth, and to golf courses in Falmouth and New Seabury. 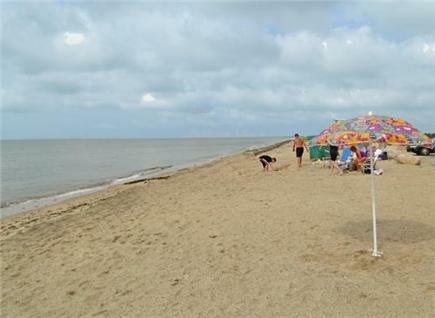 Nearest beach: Drive to South Cape or Falmouth beaches, 4 mi. 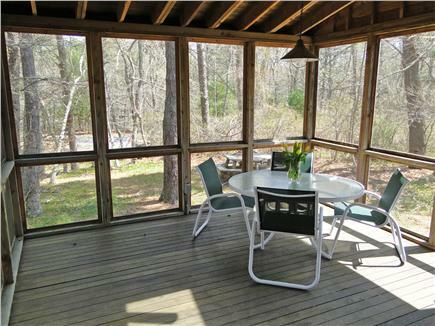 Additional pricing info: Rent for more than a week and get a discount on the weekly rate. State and local taxes of 12.45% will apply. The living space is one level above the driveway and garage. This place worked out really well for us - we had a reunion/golf weekend in the Falmouth area. The house has tons of room, lots of beds for people to sleep (Everyone got a bed!) and nice surprises such as a really cool basketball court a short walk from the back yard. Bars/restaurants a short drive, golf and beaches a short drive. Great location! Everything worked out really well - everything in the house worked. I would definitely rent here again. Thanks!